Amish Made Wall Art | Amish Originals Furniture Co.
Is your room looking tired? Are the walls of your home bare? Well brighten them up with beautiful Amish made wall art from Amish Originals Furniture Co. in Columbus Ohio. With a wide selection of Amish made wall art, and the ability to customize pieces to fit your vision, Amish Originals can help you find the perfect art for your home. Working with over 70 local Amish artisans in Northeast Ohio, Amish Originals is committed to high quality Amish made wall art. 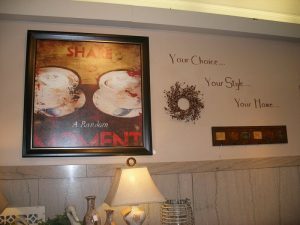 Small shops, often multi-generational affairs are the norm for the creation of the wall art we offer. Each piece comes together under the skilled hands of Amish craftsmen resulting in something gorgeous that will bring pleasure to you and your family for many years. Our Westerville, Ohio showroom is filled with the finest Amish made wall art. Our staff is ready and willing to help you with any questions you may have. Looking for that perfect piece to dress up your bedroom wall? No problem! Our staff can help you find what you’re looking for. We are committed to helping you fulfill the vision that you have for your home. Find a piece but it’s not quite what you had in mind? That’s not a problem either. Customize your order and make it exactly what you want. Visit our Westerville showroom to get a feel for all we offer and to meet our friendly staff. Live too far away and can’t make the drive? Then take a look at our online catalog and shop from the comfort of your home. Have any questions or want to know more about Amish made wall art? Then contact us today!